Danielle Davis lost her sister in April. Lauren Davis was biking on Classon Avenue in Clinton Hill when a driver turned left across her path, killing her. Now Danielle is calling on the city to add a bike lane to the street where Lauren lost her life. With the support of Transportation Alternatives, she launched an online petition yesterday addressed to local City Council members Laurie Cumbo and Robert Cornegy and Brooklyn Community Boards 2 and 3. (Classon Avenue also runs through the district of Council Member Stephen Levin, as well as community board districts 8 and 9.) In just one day, the petition has amassed more than 3,300 signatures. Lauren, 34, was biking in the direction of traffic at around 8:35 a.m. on April 15 when the driver of a 2015 Fiat turned left off eastbound Lexington Avenue and killed her. Police initially reported that Davis was biking against traffic, an account that was later proven false by an eyewitness. DOT converted Classon from two moving lanes to one in 2012 but maintained extra-wide parking lanes instead installing of a bike lane. The street remains prone to reckless driving by motorists seeking speedy passage to the Brooklyn-Queens Expressway. 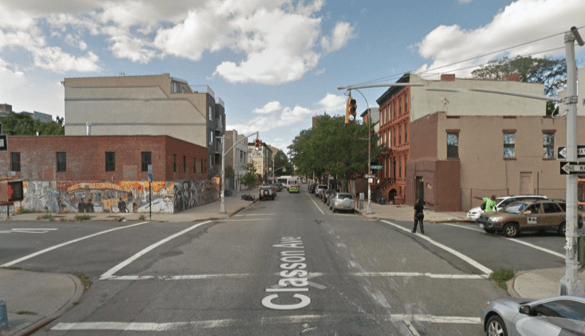 Between 2009 and 2014, 119 pedestrians and 84 cyclist were injured on Classon Avenue between Washington Avenue and Flushing Avenue, and two pedestrians and two cyclists were killed, according to Vision Zero View. In a statement released by TA this morning, Danielle Davis criticized DOT for not including a bike lane in that project. “I started this petition because I believe the most vulnerable people on Classon Avenue and every New York City street should be protected, instead of being forced to fend for themselves, which is disgraceful,” she said. TA Executive Director Paul Steely said DOT has to correct the situation. “We support this petition because we agree that it was a mistake for the DOT to paint a wide parking lane instead of putting a bike lane on a known bike route — out of fear of community board opposition,” he said. Consolidating two double parking lanes into one isn’t going to solve this problem. People can still take the turn at speed, cutting across the bike lane, which seems to be the exact scenario in which Ms. Davis was killed. This either needs to become a filtered route with greatly reduced auto traffic or get a protected bike lane with mixing zones that force people to slow down before turning. Figuring out which one it should be requires a comprehensive approach to the bike network that NYC doesn’t seem to be doing. Give it another decade or two. Looks like a residential street to me, so do what they do in Europe. Bollard it off every block or two at one end so residents have car access to it but other drivers can’t use it as a through street. It will then become a defacto bike boulevard. It’s Clinton Hill, not Crown Heights. Regardless, just signed the petition. Classon needs serious traffic calming. Drivers speed so recklessly at Putnam, just south of where this happened, to try and cut in front of each other as Classon narrows from two lanes to one. This whole street needs to be made one lane, with bike facilities at the least. As Danielle Davis said, this is disgraceful. Tried to sign the petition off an e-mail, but somehow when I clicked on it nothing happened. Traffic levels on one way Classon are similar to some two way minor arterials near you, like Bell, 73rd, Jewell. Retractable bollards which the bus driver can operate? Is there any place that makes as extensive use of retractable bollards as you and others have proposed for NYC? There is a bike station at this intersection. They’re used quite a bit in The Netherlands but afaik never to the extent that they’d be installed every two blocks on a grid. This is why the bike network needs to be planned comprehensively and probably with some feedback with surface transit. What kind of treatment works best on what streets and how will they all connect to each other? This is the opposite of the approach taken with Clinton Avenue, where a one-off project requiring a detour befuddled everyone and was a waste of time. You are so right . The solution is to take away a few parking spots and install a split phase signal that gives an exclusive right of way to cyclists and pedestrians, while turning cars have a red arrow. Dot used to install those at every intersections on bike lanes. It reduces crashes 50 to 70 % . I wish all cyclists would ask for this feature on all bike lanes….. This would bring more support from pedestrians..
I’m on Classon most days when I bike to work (which is not that often). The problem with two-way to one-way conversions is that in areas of Brooklyn where blocks are long, drivers tend to fly on one-way streets because the “friction” that used to be there when the streets were two-way (for example, a double-parked car in the other direction that causes oncoming traffic to swerve into your lane) is no longer there. And no other traffic-calming measures are installed to compensate for this. Franklin Ave, the other one-way that forms a pair with Classon, is even worse – it is still two lanes, and while it has a bike lane it’s basically useless because of the drivers’ utter disregard for speed limits. I support the petition, of course – something is better than nothing – but I no longer believe in the effectiveness of plain old, white-stripe bike lanes. DOT has supposedly moved on from 90’s-style road treatments into the 21st century, and has a wide arsenal of tools at its disposal. To make a street safe it needs to use more than just one or two of them at a time. Exactly – this is all infuriating .. we are talking about lives here, not pencils and paper! Davis was biking on Classon in the direction of traffic on the morning of April 15 when a left-turning driver in a Fiat struck and killed her. Her sister Danielle launched an online petition urging community boards 2 and 3 and local council members Laurie Cumbo and Robert Cornegy, Jr. to support a bike lane on Classon, and almost 6,000 people have signed on. On Thursday, DOT announced plans to paint a bike lane on Classon Avenue, the northbound one-way street where a left-turning driver killed Lauren Davis as she rode her bike to work last April. As bicycle infrastructure goes, it's the bare minimum -- some stripes and stencils to designate space for biking, with no changes to moving lanes or parking. But that hasn't stopped a group of local officials from coming out against it. The family of Lauren Davis is reeling after a judge at the state Department of Motor Vehicles declined to take action against the motorist who struck and killed her on Classon Avenue last year. Davis's mother, sister, and brother traveled from California to attend the hearing, and said they had been told by the NYPD Highway Patrol detective investigating the crash that he would also be there. He never showed up.